I was recently invited to the screening of a new ‘still-life’ short film made by Metz & Racine & Mototake Makishima called TUTTAVIA. Inspired by the painter Felice Casorati’s painting “Eggs on a Book’ from 1949, the film offered a curious and visual treat that had a haptic effect on me. Starting with a steady sweep shot over a range of mouldy and decaying vegetables & fruits amongst other mysterious objects, accompanied by a sound of ‘plight’ from recordings of 1940’s Italy; the brooding mood was accentuated by long ominous shadows similar to those in di Chirico’s haunted paintings from his metaphysical period early century – such as Turin Spring (1914). 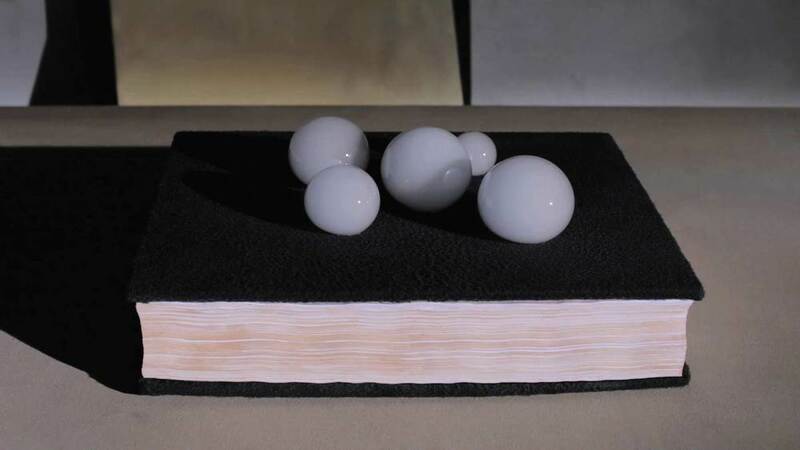 We then encounter a book with ‘eggs’ lying on it, and the still life comes alive. The glistening eggs start curiously to bounce and to dissolve into a powdery smoke – an unexpected effect. The scene becomes laden through the superposition of eggs – symbols of hope, potential, fertility, life and also fragility on a backdrop of wartime sounds. With each egg that evaporates into smoke, a sort of alchemical transformation takes place. The mood changes from starkness to lightness with another steady sweep shot over this time fresh fruits and vibrant objects. The brooding long shadows now reminisce more of a sunny late summer afternoon, somewhere in Italy, with a taste of negroni. What is interesting is how the makers manage to bring life into a world of objects that in themselves are quite ordinary, by using the illusional powers of cinema; sounds, light and angles to excite our senses as well as our sense-making. The makers describe how “TUTTAVIA depicts the compelling history and emotion of war and its outcomes”. Indeed they capture a universal quality as the film plays with a multitude of polarities, which at a deeper level can remind us of the cyclical nature of history and events, of fragility but also resilience. This is where the title gains significance, as when translated from Italian ‘tuttavia’ means: still, nevertheless, yet, then again… etc. such a word functions as a pause, a bracket, a moment of suspense between one state to another. As such, we could let it provide us with a moment to reflect on where are we now in 2014 in terms of the cycle of events?